Grown in Washington State and Oregon in excellent climate, and shipped all over the world (notably Japan and Korea -- prized for the high quality). These are export quality and could not be fresher. 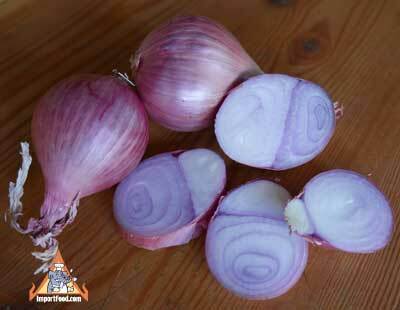 The outer skin is red / slightly brown like a normal onion, but peel back two layers and see the rich purple color of the inner layers. The white flesh of the onion is succulent. Thai Vegetarian Larb Woonsen, "Larb Woonsen Jae"
We will ship you 16 oz (about two large handfulls), protected to ensure good arrival, and sent via 2 Day shipping. Size varies a bit, but they are generally 1-2 inches long, and the outer layer may show a bit of greying which is not uncommon for shallots, and is easily removed then you can use the inner flesh. Do not refrigerate, set on counter and use within 7-10 days. Please Note: Produce ships via USPS Priority (2-3 Day) so please provide an address that can be used for USPS delivery. If you order only fresh produce, select "$0.00" as shipping charge at checkout (because the price above includes shipping). If you order fresh produce and any other items, you must checkout with "Fedex Ground" as the shipping method, and you will receive the other items separately. We pack the produce carefully and ship every Mon/Tues/Wed via USPS Priority Mail (2-3 day delivery) to ensure freshness. Occasional delays due to Mother Nature & harvest conditions. Call 888-618-8424 if you need a definite delivery date.